Unions | Something should go here, maybe later. The Westboro Baptist Church is hated by pretty much everyone. There’s a good reason for that – they’re crazy, bigoted (by anyone’s definition) and blame every single bad thing in the entire world on society’s acceptance of homosexuals. Equally universal has been the condemnation of their funeral pickets. Do I need to go into details? No, I don’t think so. You’d think that no one else would want to copy that protest tactic. That is surly basic common sense. So what group would take such a step into public infamy? A judge ordered one of Chicago’s most politically powerful labor unions to suspend picketing against 16 funeral homes last week after receiving reports that striking Teamsters had, among other things, disturbed a child’s funeral. Thus I’m helping to raise funds – for the campaign, and for the families. There are queues of union members outside the Maritime Union office door in the morning to apply for hardship, literally to feed their kids, and I can tell you honestly that they look to me like they hate having to do that, hate having to rely on other people to get the necessities of life. Now they are no longer on strike, having voted to go back to work last Thursday, but they are still not getting paid, thanks to an intransigent employer who they are taking back to court today. I was musing on the ’51 strikes mainly, and how the port workers were using their position to hold the country’s farmers for ransom, and how they actually made the farmers so angry that they went into town and broke the strike. Then I was thinking about how the port workers take home large pay packets (average $91,480) with no higher education required, often being paid many hours that they don’t in fact work. I was also musing on the history of violence in port disputes and the way that the Auckland workers seem disinterested in improving on that. Then, while I was making a snack, I noticed the photo on our fridge door of the child we sponsor. As the main component of Niger’s population (31 per cent in total) the youth (15 to 35 years old) are left to themselves and prey to a multidimensional crisis characterised by unemployment, under-employment, illiteracy, begging, migration, various diseases (especially HIV and AIDS) and low participation in development programmes. Despite the adoption of a national child protection policy in 1999, many children are still marginalised and live under particularly difficult circumstances. Health and nutrition indicators show progress; however, they are generally very low. In respect of child development, various programmes and policies have helped to improve school attendance, especially for girls (from 33.3 per cent in 2001-02 to 44 per cent in 2005-06 in primary education). Street children are being exploited and is involved in child labour practices (about 15 per cent of the total population). Almost half of the Niger’s girl population are victims of early marriages. Niger is considered to be one the most perilous places in the world to give birth and the 2008 under-5 mortality rate was 167 per 1000 live births. I don’t think I need elaborate the point too much. Suffice to say, if you’re earning $100,000 per year by virtue of your union’s ability to bully, you should be taking a cut of that money and putting it aside for the times when someone decides to stand up to you – because there are actually people in the world who deserve charity, and you are not one of them. A story of bullying from Wisconsin. There’s the problem in a nutshell. Unions bullying small business owners to support their strong-arming the state to provide public employees with better benefits than those paying the bills. There’s a place for unions, but this isn’t it. Unions have their place, but there’s always got to be balance. Update: another video that explains the situation with teachers unions. I suspect many NZers would be completely unaware of what’s going on in Wisconsin. I must confess that I’ve only picked up the second half of the story, so was interested to read this article this morning. For in the end, the images and messages tell the story. The showdown in Madison pits pampered public employees against hard-pressed taxpayers. It portrays union workers as an angry mob against those seeking orderly legislative deliberation. It paints Democratic lawmakers as outlaws on the run, undermining the democratic process. It launched a national debate about the generous salaries and benefits for government workers during a time of economic shortages. And it showcased school teachers who abandoned their children in favor of narrow, partisan political gain. A large part of the problem is that the left simply don’t understand the right. By not understanding the right, they then failed to understand the Tea Party. And by not understanding the Tea Party you end up with the situation in Wisconsin, where unions are bussing people in from all over in an effort that takes days to organise, only to be met by a larger, better behaved, local conservative counter-protest that was organised overnight. Update: See also this video. There’s no doubt at all in my mind that the “in a manner deliberately intended to be threatening” is pure spin. The document itself isn’t produced on any site making the claim, which on blogs is a pretty good sign that it’s being “liberally interpreted”. But many unionists are happy to regard being asked to do their job as “threatening”. Translation: they probably made it up. But it’s ok to call the minister Hitler. Caught, but not really repentant. Ms Campbell’s post was picked up by bloggers Whaleoil and Kiwiblog. Her page has now been made private. On Salford School’s website today Ms Campbell said she regretted and withdrew her comments. She said she was disappointed her comments had detracted attention from debate over the standards. A note posted on behalf of Salford’s board of trustees said Ms Campbell’s references about Mrs Tolley had been her own view. Frankly, the fact that the school is bought into disrepute is secondary to the fact that she made an outrageous personal slur against the education minister. That is what she should have apologised for, and the fact she has not suggest that she is not actually sorry. Since she refuses to appologise to the minister, it’s hard to see how the apology she has given is of any worth whatsoever, since the offense essentially continues and continues to bring the school into disrepute. Update: Monkey with Typewriter uses satire to illustrate the absurdity of the comparison. Because the comparison does not end here. She has, through a cunning and comprehensive propaganda offensive, managed to mariginalise and persecute a small number of blameless individuals just like Hitler did with the Jews and gypsies and homosexuals, and has ‘coralled’ them into an intellectually-constructed ‘semiotic’ – if you will – ‘concentration-camp’ of the popular consciousness. A generation of children consigned to the ‘Work Makes you Free’ Belsens and Dachaus of academic failure. When The Teachers and Principals first went to her, and came back waving (just like Neville Chamberlain) her famous pronouncements about non-aggression, did they not stand on the steps of their schools waving a similarly famous ‘piece of paper’. And then, did she not callously disregard this and storm their metaphorical ‘Czechoslovakia’ of bulk-funding and League Tables? 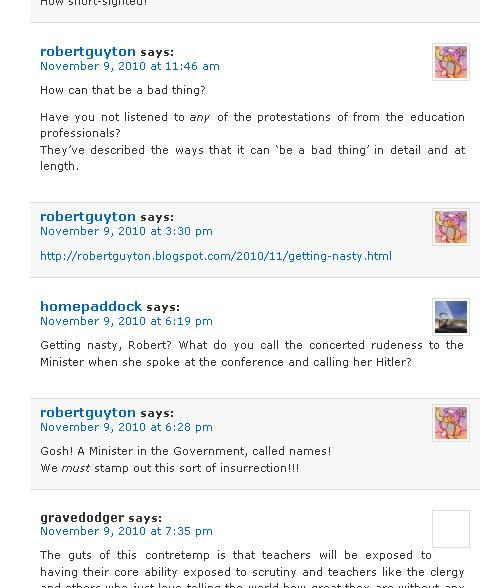 And now, having launched her ‘Second Front’ in the media by ruthlessly refusing to dock striking teachers’ pay for does she not remain, isolated, gibbering and trembling in her lonely bunker, as the combined allied forces of the parents, Boards of Governors, Principles Teachers and media, slowly, brick-by-brick, destroy her prized ‘Berlin’ of ministerial prerogative? I think that Marlene Campbell is only stating what many of us think. I fear she does not go far enough. Unions just feathering their own nest? There was a letter read on 9 to Noon today from (I think) John Barnett, head of South Pacific Pictures. It was very interesting, and if anyone can get hold of a copy it would be well worth posting. It seems that professional actors in this country do very well indeed (90k average salary), and only ever negotiate their contracts on pay (not conditions). Plus, it seems that the actor’s union was after a large pot of money that Peter Jackson had put aside for union fees or some such thing – essentially Actor’s Equity did what it did to put that money into their union’s coffers. But that’s from memory. Sadly the audio isn’t on the web site. Helen Kelly still doesn’t get it. Council of Trade Unions (CTU) president Helen Kelly said no-one would resent The Hobbit films being made here, but the cost was “outrageous”. “That a foreign corporation can come into this country and demand that workers’ rights in this industry be removed — and that’s effectively what’s going to happen today under urgency,” she told TVNZ’s Breakfast programme. What are those “outrageous costs”? They got what they wanted with legislation due to be rushed through Parliament today that will clear up confusion about the legal status of contractors and employees, and also a $20 million tax break, which was far short of what they argued for. Re: 1 – why is the film industry so lucky? Labour’s law was idiotic, and has led to many employers finding that they “actually” hired permanent employees when they did nothing of the sort. Re: 2. There’s two scenarios here. $500,000,000 injection into the economy including millions in tax, and millions worth of tourism advertising that will pay off for years to come. The destruction of large number of jobs, widespread redundancies and the destruction of our film industry as it currently is. No boost to our tourism industry, and a negative spillover into other potential investments. Profit? No, a loss of millions of dollars and massive damage to our economy as our added bonus. As Keeping Stock said this morning, Helen should just stop digging.